One of the best shows on television lately. HBO’s hit rate is just phenomenal. I’m getting ready to watch the first episode of "Rome" — I hope it’s good. And I can’t wait for the new Ricky Gervais show, "Extras," which starts in a few weeks. HBO just can’t be beat lately. FX is doing great television now, too — but that’s the only other network that’s doing work anywhere near the quality of HBO. I watched the Little League World Series championship today — man, what a game! It had everything — two small island teams playing against each other (Hawaii & Curacao), the defending champs (Curacao), a comeback from 3 runs down in the last at bat (Hawaii tied it with a spectacular suicide squeeze play and some other timely hitting), and a home run to win it for Hawaii in the bottom of the 7th (which is extra innings in LL). I found myself getting pretty wrapped up in the game — was super-excited to see the Hawaii kids not lose hope down three runs in their last at-bat and eventually come through to win. Curacao played great, too — in fact, pretty much every kid on the field was completely unbelievably great at the game. Anyway, during the game I really got excited — was reminded by a phrase in a James Taylor song: "There is a feeling like the clenching of the fist…" — and started thinking about the times when I was a kid and really felt the thrill of a game. There were lots of times when I felt that thrill, or the pain of a loss, or even the left-out feeling of not participating. It’s interesting that you don’t get many of those moments as an adult. And with Sam, I can’t help but wonder about his times to come — good, bad, indifferent. And I’m just incredibly excited that he has all of that in front of him. Who knows what he’ll do, who he’ll be, where he’ll go. Having a baby around is just an incredibly optimism-creating thing. Or it could be that I’m a little loopy because of the whole no-sleep thing. Big day! Sam’s about 6 1/2 weeks old now, and the greatest thing happened. I started sticking out my tongue at him, which consistently provoked one of two responses: he either gave me a big smile or else he stuck his tongue out back at me! Sounds like maybe not a big deal, but pretty great. Near as I can tell, it’s the first time that he really had a response to an overt stimulus from us (other than the occassional smile, sometimes stopping crying or sometimes starting crying :-)), and really one of the first times he got involved in playing a game. Fun! I’ve been getting more interested in biotech lately — realized that there are lots of things happening in the world that have a high potential to affect my life (and my wife’s & son’s) that I know pretty close to nothing about. I almost didn’t read this book because the title was so lousy — but that would have been a shame, because it was a really interesting read. Additionally, he talks throughout the book about the ethical questions of particular types of biotech. Very intersting & provocative book, and used short words for biology that a software nerd like me can understand. This is a book about the rise of American wine to world class status. Sort of a boring read, honestly. But learned a few tidbits. Like this: in the 19th century, (bad) American wine was marketed as a temperance solution — less alcoholic & insidious than the hard stuff. And I never really thought about it, but the 18th Amendment, establishing Prohibition, meant that America’s alcohol-related industries didn’t really start until the 1930s, and didn’t gain a ton of momentum until the 50s. 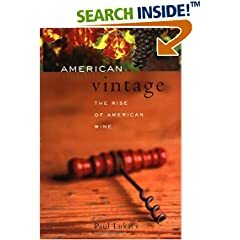 Fortified wine was a big deal; Thunderbird was a huge seller, and the world didn’t really think much of American wine until the 70s, at the earliest. I guess the other thing that it made me think about is that the global wine industry is a living, changing thing — looks different now than it did even 5 years ago, prior to 9/11. Not a fantastic book, but not bad if you’re interested in this type of thing.